Palestinian president Mahmud Abbas has broken with Washington over its recognition of Jerusalem as Israel’s capital but, popular as it is domestically, analysts question how long that tough stance can last. The 82-year-old Abbas is habitually cautious but, as protests have gripped the Palestinian territories since US President Donald Trump’s controversial policy shift, he has adopted the unusually harsh language. He refused to receive US Vice President Mike Pence during a scheduled visit — later cancelled — earlier this week, and on Friday said he would accept no further US role in the Middle East peace process. Washington was a “dishonest mediator”, he said, and “we will no longer accept any plan from it”. That stance plays well with Palestinians for whom Jerusalem is the iconic symbol of nationhood. Some 86 percent of respondents said they backed severing ties with the United States in a recent opinion poll. 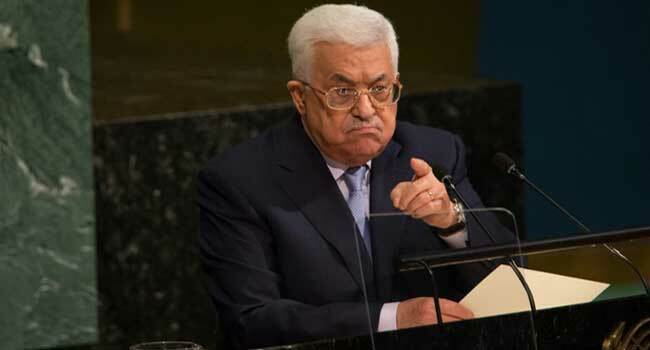 Abbas also announced they would seek full membership at the United Nations. But Washington is the only power that holds any real sway over Israel, currently ruled by what is widely regarded as the most right-wing government in its history. Prime Minister Benjamin Netanyahu has repeatedly criticised the United Nations and the European Union, two of the other members of the so-called Quartet of mediators in the peace process. Abbas has sent envoys to the fourth — Russia — and also to China to try to secure their engagement. But Israel knows no government is as well disposed to it as the United States and is unlikely to accept any other mediator. That puts Abbas in a bind. His popularity ratings have plummeted in recent years as his policy of working with Israel and the United States in the hope of a negotiated settlement has led nowhere. One recent poll found that some 70 percent of Palestinians want him to step down. his term as president expired in 2009 but political divisions have prevented fresh polls. Nine Palestinians have now been killed in clashes with Israeli troops since Trump’s announcement and each one puts more pressure on Abbas not to back down. “The Americans for a long time have been with the Israelis — more Zionist than the Zionists,” one protester, Imad Mohammed, told AFP. “Abbas sees this policy as his least worst option,” Zalzberg said. But he stressed there would be a cost — without Washington as mediator, there would be no more peace talks. Nadia Hijab, executive director of Palestinian think-tank Al-Shabaka, said Abbas would need to obtain significant concessions to return to the table without losing face. “The obvious thing would be for the Americans to step back from Jerusalem recognition but I can’t see Trump doing that,” she said. As such, Trump has calculated “the Palestinians will eventually come back to the table,” he said. In the short term, the Palestinians risked losing a significant chunk of the more than $400 million in annual aid they get from Washington, Rumley said. Draft legislation currently going through Congress would make some aid conditional on Abbas blocking payments to the families of Palestinians killed while carrying out attacks against Israelis. Many Palestinians consider such attacks resistance against military occupation and Abbas has held out against cutting the payments for years. But without Trump’s support, the so-called Taylor Force Act could see US aid cut by more than half. Israel has also announced thousands of new homes in settlements in the Palestinian territories since Trump’s election, with his administration’s public criticism of such expansions less vocal than under Barack Obama. Abbas’s riposte has been a renewed drive for full recognition of Palestinian statehood but Rumley said that will do little to change the reality of Israeli occupation. “The international campaign has diminishing returns at this point. It was useful when peace talks were on the horizon for garnering leverage,” he said.